I think overall it is a good hotel, great location (close to shopping and restaurants), friendly staff, fairly good breakfast. The room was rather large. Tea and coffee available 24h next to the reception. Free parking in the garage. Air conditioned room with a high sealing. Very nice place to be in during the +30°C heat wave. Good breakfast and great location near the old town. Very helpful staff. It was possible to leave the car in the garage for the day of our departure. Nice hotel in the center, free private parking, strong wifi, super kid friendly as it had a play corner next to the reception, and plates and utensils for children at breakfast. Free (finnish) coffee until late at night downstairs. Breakfast excellent! All what you need from basic hotel room. Quite good breakfast. Good complimentary parking lot and good breakfast! The breakfast is good and plentiful. Attentive staff, all with good English. Very well maintained property. Knowledgeable about what to see and do nearby. Close to the old town and to the parks. Also the beautiful railway station and a nice shopping mall are near. I advise to take the boat trip to Tankar lighthouse island. Excellent location in the centre. Comfortable rooms and breakfast incl. some local specialties. Great informative friendly staff. Nice bedrooms and comfy bed. Hairdryer, coffee making facilities in lobby, trouser press, iron and ironing board, tv. Good facilities. 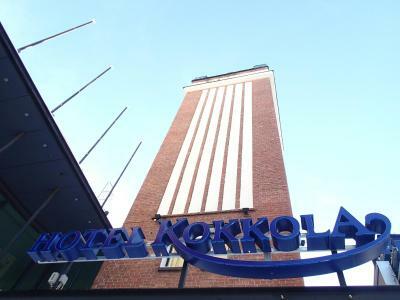 Hotel Kokkola This rating is a reflection of how the property compares to the industry standard when it comes to price, facilities and services available. It's based on a self-evaluation by the property. Use this rating to help choose your stay! One of our top picks in Kokkola.This hotel is 1,150 feet from Kokkola Train Stationin and 14 mi from Kruunupyy Airport. 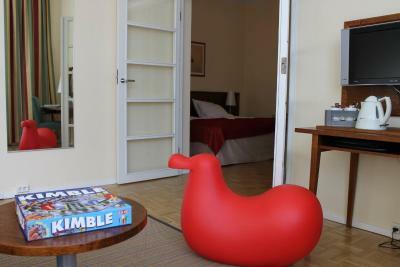 It features a bookable sauna and air-conditioned rooms with a mini-bar and free WiFi. On-site private parking is free. Hotel Kokkola’s classically decorated rooms feature a work desk and TV with cable and pay-per-view channels. Drinks and snacks can be enjoyed at Kokkola’s lounge bar. The hotel is 1.9 mi from the Gulf of Bothnia. Staff can help arrange boat trips to the surroundings islands. This property also has one of the top-rated locations in Kokkola! Guests are happier about it compared to other properties in the area. When would you like to stay at Hotel Kokkola? Air-conditioned room featuring a desk, a mini-bar and a flat-screen TV with satellite channels. Features an armchair with laptop support, bathrobes, slippers and an electric kettle. Features either an exercise bike or a cross trainer, bathrobes, slippers and an electric kettle. House Rules Hotel Kokkola takes special requests – add in the next step! Hotel Kokkola accepts these cards and reserves the right to temporarily hold an amount prior to arrival. I think that room service (cleaning the room, changing towels) could be better (more frequent, I think they skipped our room at least once and towels were never changed even though some of them were put on the floor). Also I would prefer to have soap and shampoo rather than all-in-one bottle liquid something... But these are not really critical issues. We were very comfortable during the stay but a huge plus would be an upgrade of the facilities; I would remodel at least the bathrooms. We were tywo days on Kokkola. The room was not cleaned at all! Sunday morning the breakfast-table was not ready, but only about 7. 40. Well, no drama. However, on should kerp the promises. No english text’ s about safety in the rooms at all, only in finnish and swedish! Some of the beds too old and worn, shower needs repair even still functioning.